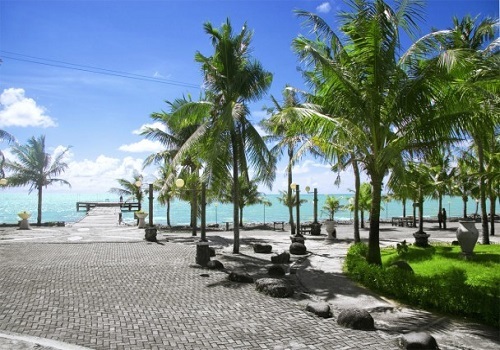 Akkarena beach is located at the coastal side of the city of Makassar, more precisely in front of Makassar Mall GTC, just about 10 minutes drive from the city center by private vehicle. Akkarena beach is a stunning black sand beach and is a a great choice for hanging out with family. It offers a variety of means to relax and play for grown-ups and kids. Akkarena beach not only offers beautiful beaches, but it also offers a variety of facilities, including playgrounds (with seesaw, swings and sliding boards), restaurants and a park. This park is called Akkarena Tanjung Bunga, which was built in an area of 12 hectares and is usually open from 7:00 am until midnight. In the park restaurants and warungs serve local and international food and drinks and live music is performed here in the evening. You can do various water sports and various games such as banana boat, jet sky, and drive ATV bike, but you can also just relax, enjoy the breeze and the beautiful Akkarena beach. The entry fee is only Rp. 5000, car parking is Rp 2000 and Rp. 1000 for a motorbike.